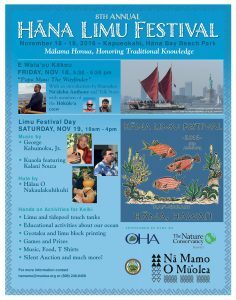 Nā Mamo O Mū‘olea has announced that the 8th Annual Hāna Limu Festival will take place on Friday, Nov. 18 and Saturday, Nov. 19 at Hāna Bay Beach Park. This year’s theme is “Mālama Honua”. 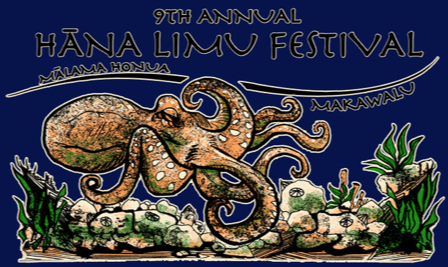 The 8th Annual Hāna Limu Festival will take place on Friday Nov. 18 and Saturday, Nov. 19 at Hāna Bay Beach Park. 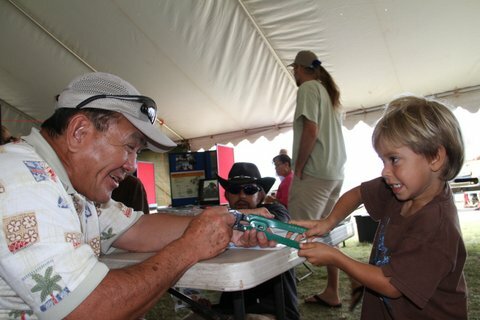 The Limu Festival is organized by Hāna residents and is designed to promote a deeper understanding of native limu (seaweed) and to make people mindful of their role in ensuring ocean resources are here for generations to come. 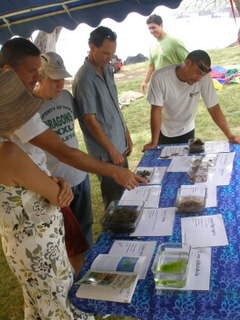 Several collaborating partners and co-sponsors help with the event, including The Nature Conservancy and the County of Maui. The festival focuses on how Hawai‘i’s oceans and fresh water – and the health of limu, fish, plants, culture and more – are inherently connected. Native limu is a nutritious part of the traditional Hawaiian diet and is vital to the health of the nearshore ecosystem, serving as the base of the food chain, and providing food and shelter for fish and invertebrates. 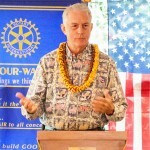 The festival will include music, booths, games, crafts, hula, a silent auction and cooking. Each year funds are raised through the silent auction which allows Nā Mamo O Mū‘olea to award the Isabelle Aiona Abbott Scholarship to Hāna students who want to follow in the footsteps of Dr. Abbott, the pioneering Hawaiian limu expert who was born in Hāna. The OHA grant will allow the organization to increase the amount of the scholarship this year by supporting most of the festival operations, including the free limu-based dinner provided to symposium attendees on the evening of Friday, Nov. 18. From 5:30 – 8:30 p.m. on Friday, Nov. 18 a presentation from Hōkūle‘a crew member Nakua Konohia-Lind will take place at Helene Hall, Kapueokahi – Hāna Bay Beach Park. Konohia-Lind has been on 12 of the 24 legs of the World Wide Voyage and will talk story with other members of the crew. They will also honor Samuel Kalalau Jr., a Hāna kūpuna who was part of the crew on Hōkūle‘a’s first voyage to Tahiti in 1976. There will also be a screening of the award winning film, “Papa Mau: The Wayfinder” with introduction from the filmmaker Na‘alehu Anthony with live music by Halemanu. 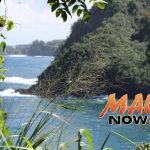 From 10 a.m. to 4 p.m. on Saturday, Nov. 19 there will be hands-on activities, entertainment and the chance to talk story with kūpuna and limu experts at Hāna Bay Beach Park. Activities include keiki games, art projects, interactive science and cultural activities, a limu and tidepool touch tank, food and craft booths, a silent auction and live music by George Kahumoku Jr. and Kuaola featuring Kalani Souza. There will also be Hula from Hālau O Nakaulakuhikuhi, under the direction of Kau‘i Kanaka‘ole, granddaughter of Aunty Edith Kekuhikuhi Kanaka‘ole and grandniece of Uncle Nakaula.